The spokesman for Brazil's President Luiz Inacio Lula da Silva says the Brazilian leader has invited Bush to come fishing. Marcelo Baumbach says Bush made a farewell call to Silva on Monday and received the invitation. Bush also invited Silva to visit him in Texas. Aside from being sociable and friendly, Lula, by publicly issuing this invitation, is further distancing himself from Hugo Chavez's highly inflammatory brand of politics. 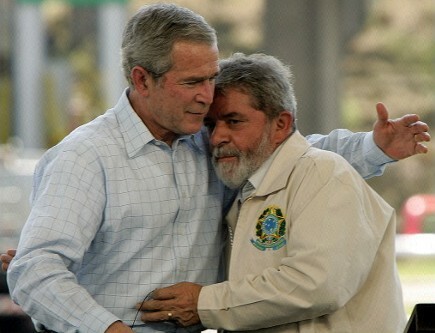 Just last week Chavez was saying that Obama has the "stench" of Bush; Lula is very much aware of Chavez's position. To further drive his point, O Globo quotes Lula as saying that "it's been a privilege to have been among the presidents who are building good relationships with the United States." Now what would be really interesting is if the UN nuclear inspectors were invited. Fausta Wertz also blogs at faustasblog.com.